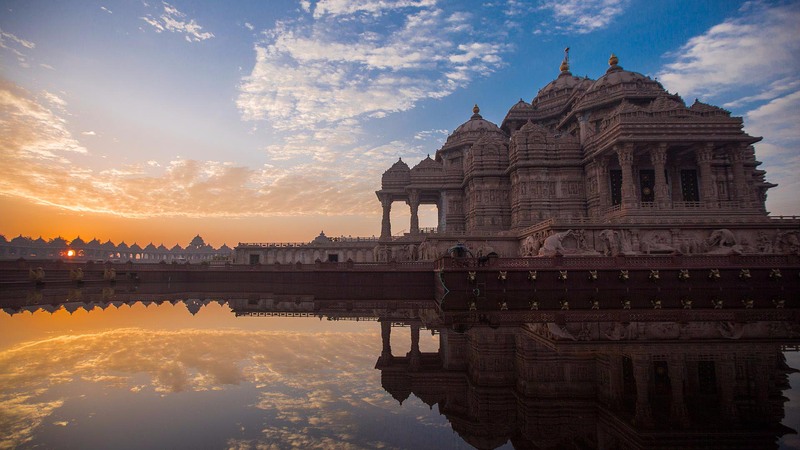 For many years, Angkor Wat held the record for the world’s largest temple (until eclipsed by the Delhi’s incredible Akshardham). But still the complex of this 12th century AD temple in Cambodia boasts some extraordinary features, many of which had been hidden till now. One of these brilliant structural aspects pertain to a recently identified spiral design that was accompanied by eight buried towers at one end of the complex. The spiral structure, supposedly built from sand, alone measures 1,500 m × 600 m (about 0.93 mile x 1,970 ft) – which is equivalent to a whopping 167 football fields! 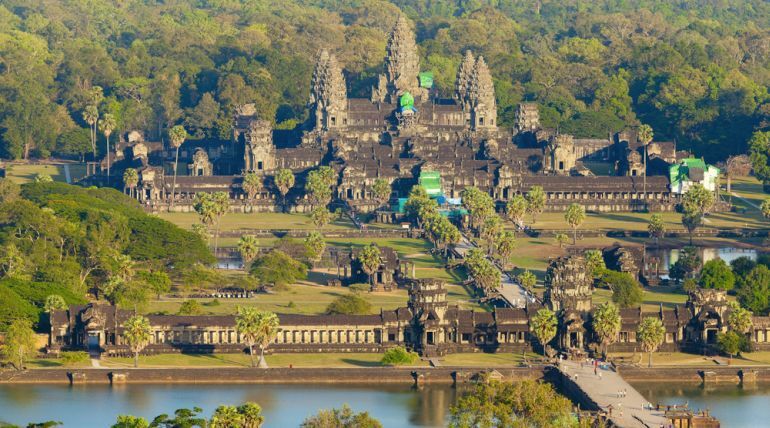 The assessment was carried out by researchers from the University of Sydney; and according to them it is the most striking discovery made that relates to the humongous scope of the Angkor Wat. Suffice it to say, the gargantuan structure in question here is not visible because of years of invasion by the surrounding jungle vegetation. But the archaeologists identified the architecture by using LiDAR, which entails a laser-scanning system that can detect ‘hidden’ surfaces beneath natural outgrowths and contemporary buildings. And on further examination, they found that this massive design equated to layers of sand arranged in spirals, while dating from the same period as the main Angkor Wat temple. The question naturally arises – what was the purpose of such a huge structure being built out of tepid sand? The researchers unfortunately do not have the answers. Though one hypothesis puts forth the notion regarding how this spiral construction may have served as a complementary temple garden which was used for both rituals and producing local food. As for the spirals themselves, the shapes could have served some spiritual or symbolic purpose. Interestingly, the structure was already abandoned for a long time, which could also mean that the main design plan was never completed. 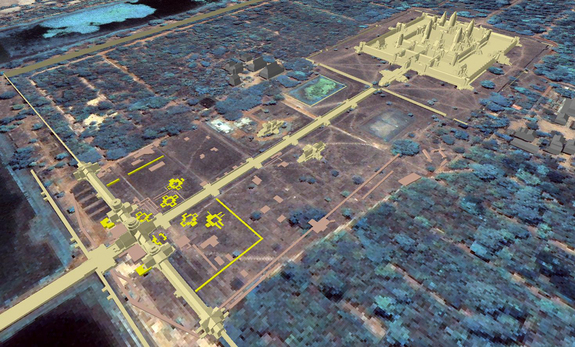 Image courtesy Khmer Archaeology Lidar Consortium, KALC. As for the other fascinating detection made by LiDAR technology, the archaeologists came across remains of eight crumbling towers made of sandstone and laterite rocks. Located on the western edge of the Angkor Wat complex, they stood guard over the gateway that passed through the surrounding moat. Intriguingly enough, many of these towers were collectively arranged along square plans. These plans in turn could have supported an entire shrine that embellished one of the entrances of the Hindu temple. But this shrine was probably demolished in favor of the completed construction of the main temple and the gateway. The researchers additionally discovered ruins of their constructional works, including proximate houses and ponds that may have been used by the laborer colony involved in the 12th century project. 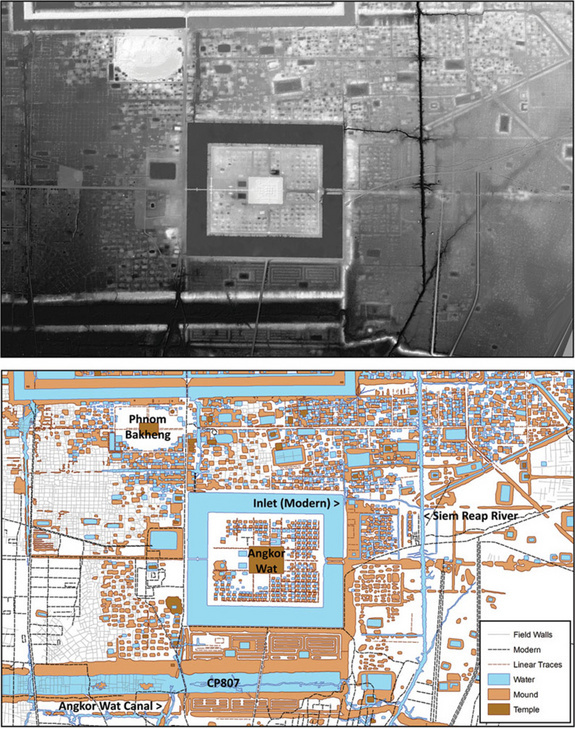 More interestingly, the archaeologists were also able to map out the ‘evolution’ of the Angkor Wat temple complex, and how it was converted into a Buddhist temple from the original Vishnu (Hindu god) venerating structure. In a contrasting manner, the same period also oversaw the transformation of the astronomical 1,626,000 sq m complex into a military fort-like compound, with specific defensive wooden structures being built along the moat. Image by Till Sonnemann and image base courtesy of ETH Zurich.